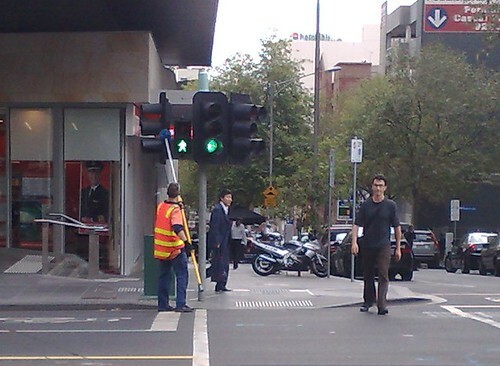 Here’s a job I never knew existed: traffic light cleaner. Well someone has to do it! Funny, a radio presenter discovered them recently too. I think in the past the job was done by the light bulb replacement person. I can only remember seeing the cleaners around for about five years. Yes – have seen them before. They also pull the crap off the traffic light poles for garage sales, lost dogs, political meetings, etc. 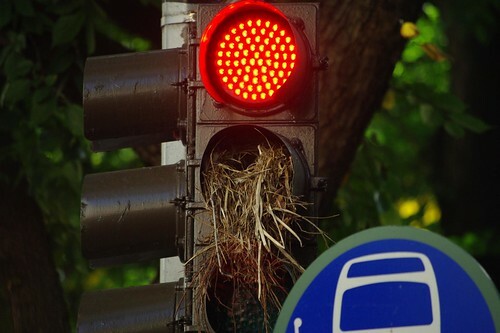 With the increasing prevalence of LED traffic signals, the lighting element doesn’t need to be changed anywhere near as often, so waiting for replacement time probably lets too much much build up. I remember noticing a need for that job in New York…..
What’s the the traffic light being so low one could simply reach up and touch it? Or is that a Melbourne thing?